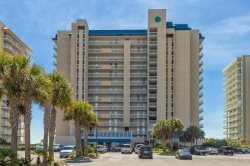 Windward Pointe is a beach front condo located in Orange Beach, Alabama. Property amenities include indoor and outdoor pools, steam/sauna, hot tub, tennis courts and a grilling area. There is a boardwalk from the pool to access the beach. Unit amenities include tile throughout, reclining sofas, beachfront master bedroom, flat screen tv's and dvd players.